I woke up this morning in a city at a complete standstill. 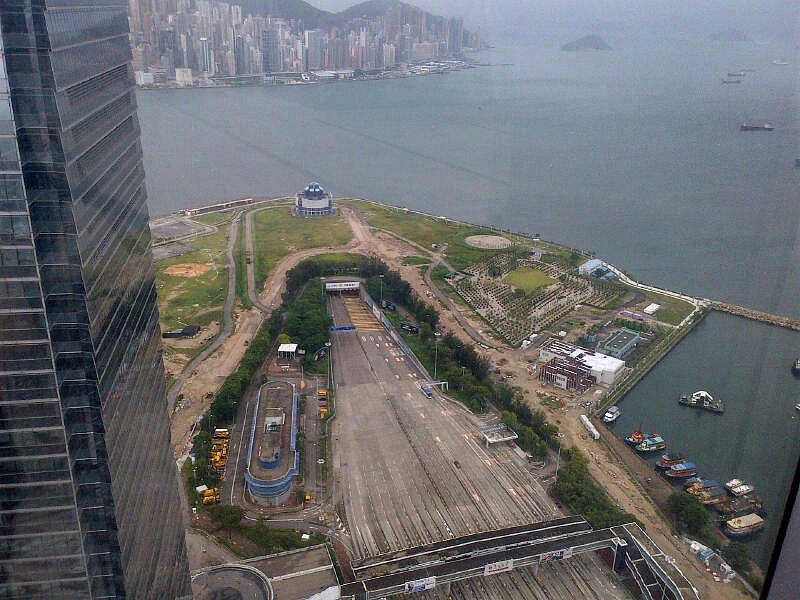 Hong Kong – the normally heaving metropolis from dusk till dawn — a ghost town. From the forty something floor, the tops of trees swaying below me were the only signs of movement – a dark sky and patchy rain, reminders a super-typhoon with winds gusting up to 140km an hour was skirting Hong Kong. There was not a soul to be seen (apart from security guards at the front gate wearing crash helmets). In a city that never sleeps, Hong Kong was in a temporary coma. At 1:40am, with Typhoon Utor 300km off the coast, the Hong Kong Observatory hoisted Storm Signal 8 – the second highest signal – forcing the government to open 17 temporary storm shelters…and locals to batten down the hatches. There are four storm levels, increasing with intensity from Signal 1, 3, 8 to 10 being the highest. If the ultimate number 10 is hoisted – it means the typhoon is 100km or so off Hong Kong and considered a direct threat, with the eye of the storm set to pass over the city. Thankfully most skyscrapers are now built using concrete and can withstand substantially high wind speeds and for the most part – act as barriers, minimizing the danger. The MTR train system is also largely built underground – but even so, when a T8 is launched — the city closes down, completely! 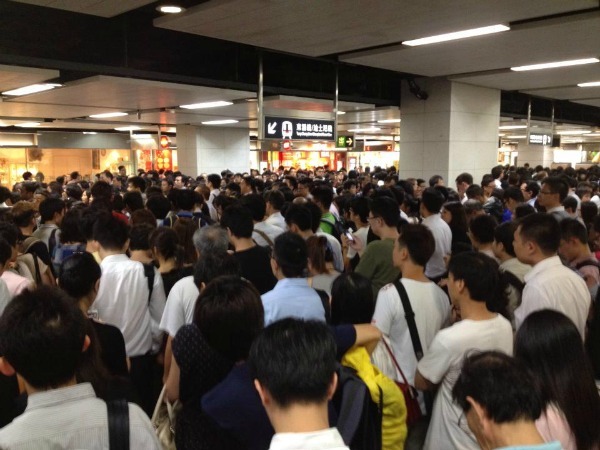 Schools aren’t open, banks are shut and if you work in an office it’s most likely closed for business – ferry services stop running and the super slick MTR trains that run every two minutes are reduced to twenty minute schedules. And you’ll struggle to hail one of the 70,000 iconic red taxis that normally flood the city streets. Roads all but empty. In a city where 90 percent of people use public transport – it’s clearly a deterrent in attempting to get to work. Hundreds of flights are delayed and many cancelled; with waves of over 11 metres expected in the South China Sea, container ships have ground to a halt. Even the Hong Kong Stock Exchange has been closed for the day. Hong Kong is in lockdown mode. 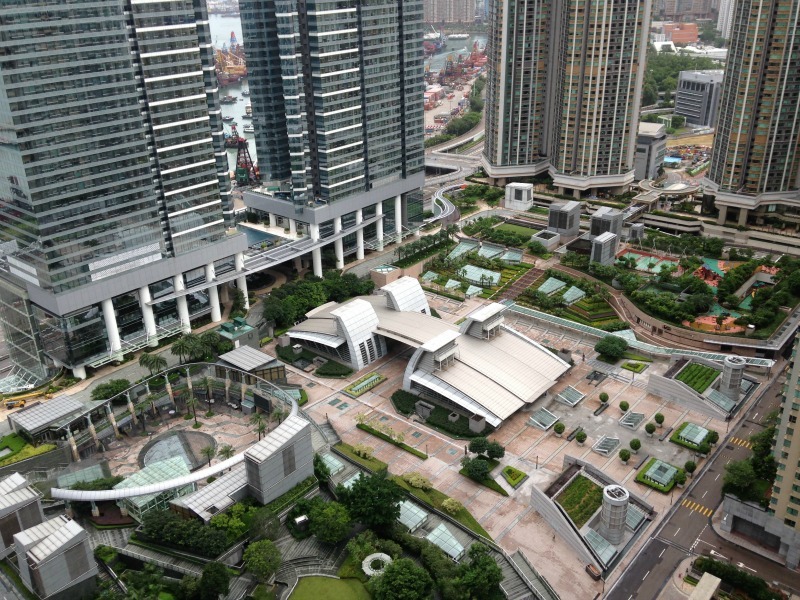 Typhoons regularly skirt the edges of Hong Kong and this city has become adept at dealing with them – possibly, many will say – to the point of being overly cautious. Sadly though it’s no laughing matter, the reality of a severe typhoon is all too evident in the Philippines. Sitting directly in the middle of the Pacific Ring of Fire the South East Asian archipelago has once again born the brunt of another deadly storm. 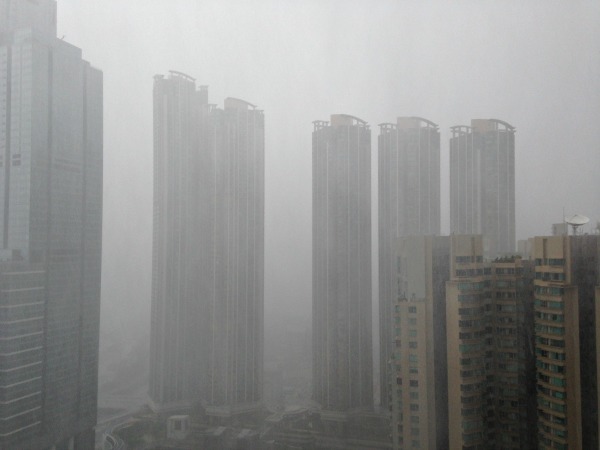 Typhoon Utor has killed at least six people and left thousands of residents homeless, with several still missing. 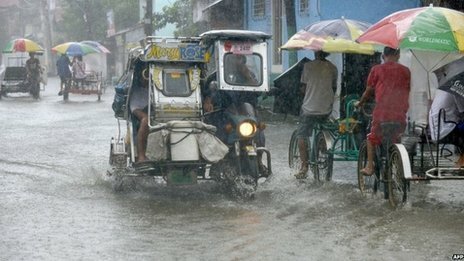 The Philippines is battered by no less than 20 typhoons each year, hundreds of people dying in their path. In Hong Kong, Utor is the fifth tropical cyclone to raise a typhoon signal this year and the first severe typhoon in 13 months. 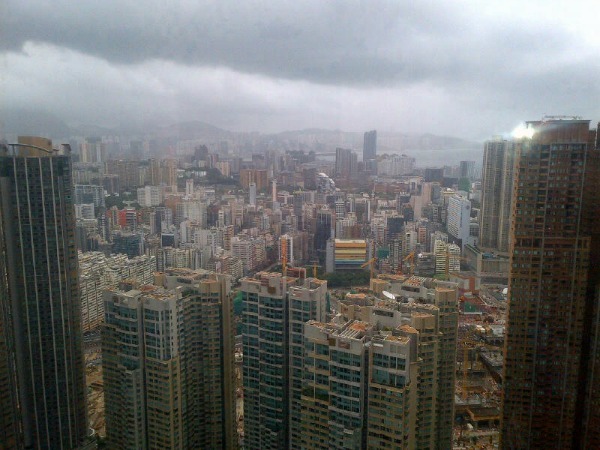 Last July, Typhoon Vincente was the worst typhoon to hit Hong Kong in 13 years, causing chaos across the city. Utor isn’t expected to hit Hong Kong directly but is heading towards the western coast of Guangdong in southwest China, nearer to Macau and the island of Hainan. Meantime, here in Honkers, we just wait it out…….the rain continues and a city of millions is stranded indoors, passing the time…(some gathering for impromptu parties in their complex, I’m told) or if you’re trapped with a toddler like me – hopefully managing to stay sane! 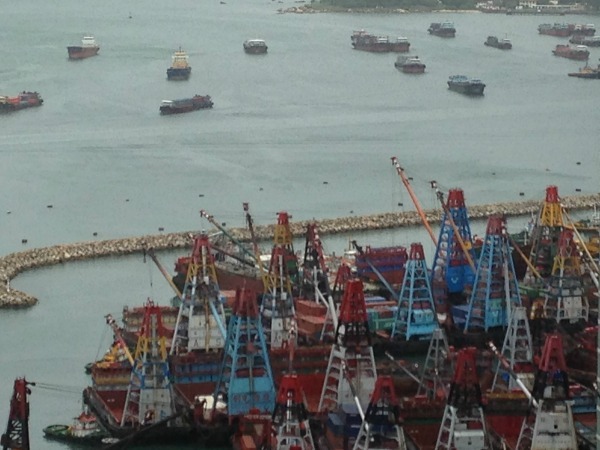 However tame the typhoon may turn out to be, I still can’t help but take my hat off to Hong Kong – I’ve seen many cyclones pound Australia and people who’ve been out and about in the eye of the storm suffer the dramatic consequences. At least this way, if it turns nasty, casualties and damage is minimized. In a city that’s often branded a little OCD – being black and white about its typhoon tactics is probably for the best right? Who needs 50 shades of grey complicating things when the weather’s already on the case. It’s just the way it is, in Hong Kong. I know exactly how you feel… after 14 years and 14 hurricane seasons living in South Florida (and a car crushed like an accordion in my driveway after Hurricane Katrina… fortunately I wasn’t in it), there’s no such thing as being ‘over cautious’. Storms have a mind of their own and even if they veer off at the last minute, it can go either way so better to be safe than sorry. Stay safe and maybe bring out the finger paints… that’s always fun with a toddler!